For some reason, the majority of our walk-in customers this past weekend were looking at our dishwasher displays. It was one of those unexpected waves of interest and we found ourselves chatting with them about their current dishwasher and plans for replacement. Whether you’re a new homeowner, remodeling your kitchen or just want to upgrade your appliances, getting a new dishwasher is an exciting, significant purchase. It can be daunting to try to find the right dishwasher for your family, but after you sort through the different designs, decide if you want the steam prewash and settle on a color, the most important thing is to keep it running well for years to come. It takes effort to pick out a dishwasher, and they’re often expensive. However, many dishwashers are made well and can last a long time. The biggest aspect that can interfere with the longevity of a dishwasher is human error. Some people don’t take proper care of the appliance, while others may not realize that they’re damaging the machine when they overload it or use it incorrectly. Here are a few tips that families and homeowners should keep in mind, to ensure that their new dishwasher will continue to run like a dream for years. The best way to make sure that your dishes will be clean when they come out of the dishwasher is to put them into the machine already fairly clean. You don’t need to wash your dish completely before putting it in the dishwasher, of course, but you’ll find the best results if you scrape or rinse off the plate first, Apartment Therapy’s TheKitchn advised. It there are some food remnants left on a dish when it goes in the dishwasher, it may come out clean, but there may be residual bits on other glasses and plates. In addition to keeping the plates you put into the machine clean, it’s important to keep the dishwasher’s interior clean as well. A dirty dishwasher can lead to subpar cleanliness for dishes. As Small Notebook explained, the interior of the dishwasher can build up grease, calcium and detergent residue. Don’t worry you won’t have to get down on your knees and scrub the inside of your machine, cleaning a dishwasher clean is similar to cleaning an oven. You should start the dishwasher on a normal setting while empty. After about three minutes, add a few cups of white vinegar. Restart, finish the cycle and you’ll have a clean dishwasher. Other parts of the dish washer may need to be cleaned by hand, including the trap, the drain and the sprayer. The trap should come out easily, so you can rinse out any remaining food bits. The drain may require slightly more effort and a towel you don’t mind getting dirty. Clearing out the drain can help ensure that water isn’t sitting in the dishwasher longer than it should be. Just as the drain may clog, so too can the sprayer arm. Any buildup on the arm can change the direction or amount of water that comes out, which can have a negative effect on dishes. 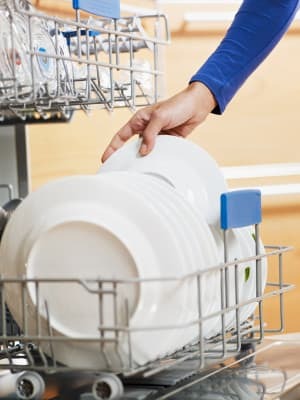 An important point to remember begins with installation: When contractors are putting in your new dishwasher, ensure the output line is clear of kinks and installed properly. Otherwise, disposal water can potentially leak back into the new unit during cycles. If you have a spotless machine and you meticulously clear off plates before cleaning them, the issue may be with your water. As HowStuffWorks explained, hard water is “the biggest culprit of stains on dishes and glassware.” Although hard water might sound dangerous, you don’t have to worry about any issues from drinking it. All that hard water means is that it’s richer in minerals like calcium and lime, which can translate to more spots and stains on you glasses and plates. Luckily you can have your water tested. If it’s too hard, you may be able to have the water softened. If you’re in a situation where you get the water from the city or a place where you will not be able to soften if, a product that works to soften the water in the dishwasher rather than at the source may be preferable. If you’re unhappy with the results you’re getting from your dishwasher, the issue may not be with the machine, but instead with how you’re using it. As TheKitchn pointed out, overcrowding the dishwasher is frequently the reason dishes come out dirty. Trying to squeeze one or two extra pieces in may lead to items being blocked and the water not properly reaching each dish. It may be better to leave that one extra glass out than to have an entire load come out dirty. Not only should you use the dishwasher correctly, but you also have to use the correct amounts of soap. Too much soap won’t help everything get cleaner, but it may cause problems in the machine, resulting in soap spots or just wasting your soap. The same goes for rinse aid. Do you feel as though your dishes aren’t as dry as you’d expect? Newer technology tends to lean toward eco-friendly condensation drying as opposed to traditional heating elements. Condensation drying may take time to adjust to, but it offers numerous benefits: You won’t need to worry about food baking onto dishware and there’s no risk of plastics melting in the dishwasher. You may want to consider investing in a rinse aid to assist in drying, however. By properly using a new dishwasher right off the bat and keeping it clean, families can ensure that they’ll have it for a long time.